In 1800, David Thompson and Duncan McGillivray of the Northwest Company followed the north bank of the Bow River upstream, to the mountains, perhaps, following the very path shown in the photograph above. First Nations people though, had been in the area a very long time before Thompson. Archaeological records place First Nations people in the Bow Valley around 11,000 BCE. People have been hunting, gathering, trekking and questing around the province for millennia and of course, they have left pathways. I enjoy pathways. They are the challenge of the unknown and they offer choices. Should I go this way, or that? Joseph Campbell suggests that we all have to find our own path, that if it’s not our own, it’s someone else’s. But that doesn’t mean that our own particular path shouldn’t intersect as needed and necessary, with those who have gone before us. Pathways from the past offer us opportunities learn the lessons of those who have preceded us. By looking through their eyes, we can add layers of flavour, meaning and perspective to our own journey. In 1800, David Thompson and Duncan McGillivray of the Northwest Company followed the north bank of the Bow River upstream, to the mountains, perhaps, following the very path shown in the photograph above. 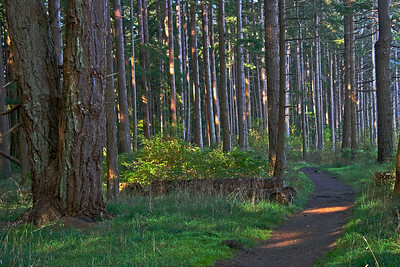 A dark pathway through towering second growth rain forest, leads down to China Beach on Vancouver Island. 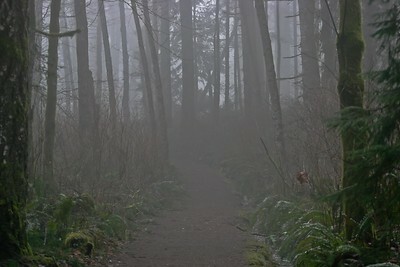 A fog shrouded pathway that leads down to Seal Bay Nature Park near Comox, B.C. The path not taken. Cape Flatterry, Washington, State. Rathtrevor Beach Provincial Park, Vancouver Island, near Parksville. 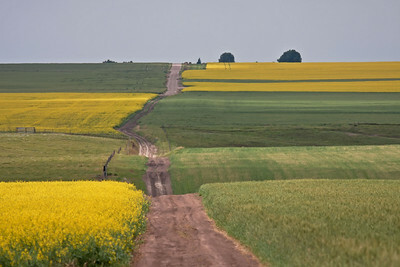 A rutted pathway into a farmer's field, near Hanna, Alberta.